Ansible is an open-source automation tool. Ansible can help you on the platform, configuration management, application deployment, intra-service orchestration, and provisioning. It is very simple to setup and more powerful tool. In other words, it frees up time and increases efficiency. Nowadays most of the Automation tools require agent but Ansible just need SSH connection and Python (2.4 and more). If your system is not registered with RedHat subscriptiton key then first you need to enable the epel repository to install Ansible. If your system is registered with Redhat subscription then execute mention command to enable the Ansible Engine repository. Once repository has been installed on your system you are ready to install Ansible on server. Run the mention command to install Ansible. 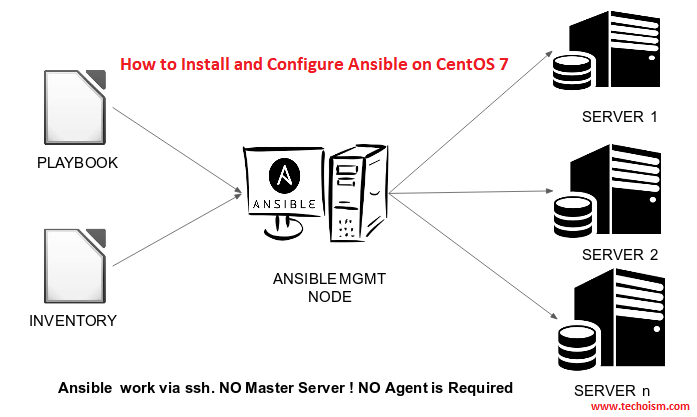 To perform any action or any deployment from Ansible server to remote server you need to create a Ansible user in all the machines and need to configure the passwordless login from Ansible server to all the remote host. Also normal user has an rights to switch to the root without password. Create user in all the remote host with root rights. Edit sudoers file and add the mention line. Follow mention steps on Ansible server. After copying the SSH key to remote host, passwordless configuration has been completed from Ansible server to remote host. Now you are ready to use Ansible automation tools. Here is few more configuration for Ansible. Edit Ansible configuration file and do the changes as per your requirement. I am just mentioning my configuration.